When Emory Fanning was growing up in Wilmington, Del., he sang in a cathedral choir to organ accompaniment. Both the choral and instrumental aspects of this experience shaped his life. Fanning became a consummate organist and choir director, spending most of his post-graduate career at Middlebury College. In fact, it has been 50 years since Fanning joined the college’s music faculty. Though he retired 20 years ago from his full-time professorship, he has continued to serve as the college organist, direct an alumni choir he founded, and give private organ lessons on campus. Fanning will celebrate a half-century of Midd affiliation with a gala concert this Sunday, October 1, in Mead Chapel. Reached at his Middlebury home, Fanning ;says he has been practicing 10 months for this concert. He will play favorite works, including a piece by François Couperin, two by Johann S. Bach and two by César Franck. Franck (1822-1890) is Fanning’s specialty: He did his graduate dissertation at Boston University on the composer-organist and the development of the 19th-century organ. Later, during a 1990 sabbatical year in Paris, he researched Franck’s manuscripts. Fanning’s published results were then translated for French publication. The trip also allowed Fanning to regularly play the same 1858 organ at the Sainte-Clotilde Basilica on which Franck once worked out his improvisations and compositions. Fanning has programmed his “all-time favorite” piece — Franck’s Chorale No. 2 in B minor — which is widely considered the greatest organ work of the 19th century. The other Franck piece is a duo originally written for organ and piano but most often performed on solo organ. Fanning’s wife, pianist Diana Fanning, an affiliate artist at Middlebury since 1975, will play the piano part in a rare performance that uses the intended instrumentation. Three pieces will sample 20th-century works. Percy Whitlock’s "Scherzo," from 1929, is “only two minutes long but a charming little thing,” says Emory Fanning. It will be balanced by a religious work by Herbert Howells, Whitlock’s rough contemporary; the two died in 1946. “Arietta” — a lyrical “little aria” — by the Italian American Norman Dello Joio (1918-2008) is the program’s most contemporary piece. Fanning will play Mead Chapel’s Gress-Miles organ, on which he played the inaugural concerts when it was installed in 1971. At the time, he recalls, he had to schedule “16 to 18 students around the clock so that they could all get in practice time.” Currently he has two students — a decline Fanning attributes to the gradual disappearance of paid church-organist positions. Hamlin has attended many of his former teacher’s recitals, at the Middlebury Bach Festival and other events, since joining Midd in 1992. “He’s truly an international-caliber player,” the composer opines. “Organ is a funny instrument; you can’t shape a note as you play it. But he’s so good [that] he can create expressiveness in the way he releases the notes, or by moving his hands like he’s making a vibrato. 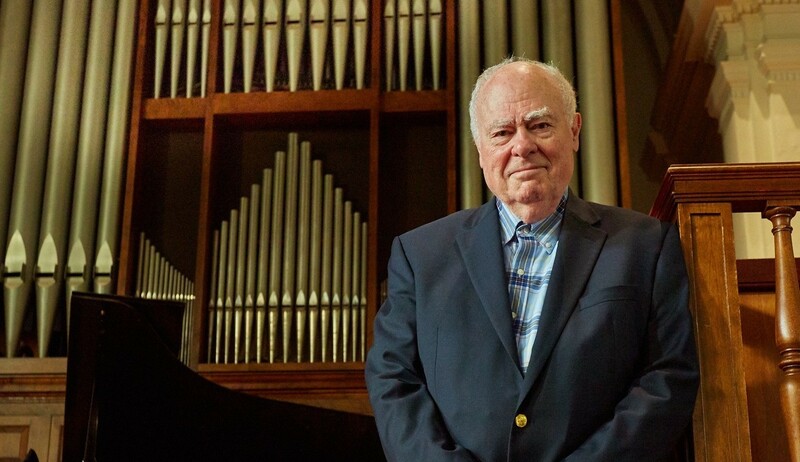 Emory Fanning’s 50th Anniversary Organ Concert is Sunday, October 1, 4 p.m. at Mead Chapel, Middlebury College. Free.